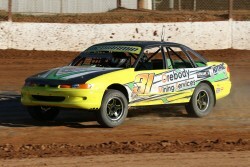 West Australian Kane McDiarmid was officially the quickest car in official practice for the MIXXFM, Speedway Sedans Australia, National Production Sedan Title at the Western Speedway, Hamilton of Friday afternoon. In warm and overcast conditions, McDiarmid set the quick time in an early practice session, to be just 0.019 quicker than Joel Berkley. The top 34 drivers were separated by exactly one second, while the entire field was only separated by 1.544 seconds, with every driver practicing. The two hour practice session was not without incident with Neil Keldoulis from Queensland towed from the circuit with mechanical issues, while Shane Hammond driving a Sigma, also requiring the tow truck after losing a wheel in the main straight. McDiarmid who has finished second and third in previous National Titles, was consistently fast and will be one of the favourites this weekend. Twelve qualifying heats will be held on the opening night (Saturday), with the remaining four heats to be held on Sunday evening. Racing commences at 5.00pm EDST.